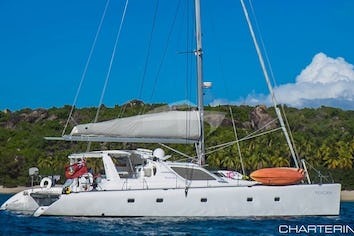 Marmot is a luxurious 67 ft. Lagoon catamaran. 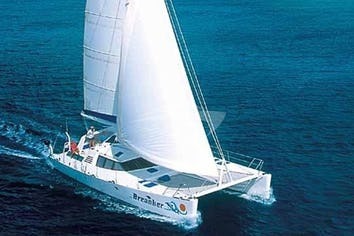 With a beam of 37 ft. the yacht offers an abundance of space for groups of up to eight guests. Marmot's large covered cockpit area with a generous dining table has ample room for eight people to dine alfresco style or to just sit back and enjoy a cocktail and catch up on their tan. 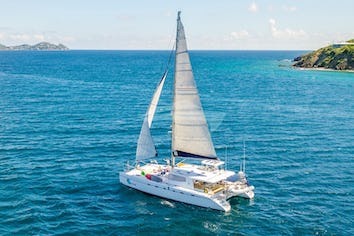 With the over-sized trampolines and lounging mats, there's no shortage of comfortable areas to relax and enjoy a book, soak up the Caribbean sunshine or to just sit back and watch your friends and family enjoying the yachts' many toys. The yacht's interior boasts both style and elegance with a very spacious salon offering multiple seating areas and 360 degree views. The salon also features a 32 in. flat screen TV that rotates a full 360 degrees so you can watch it from anywhere in the salon plus a DVD sound system.